The ODHA Circle The Barnes Museum has a substantial exhibit about Gordon MacQuarrie and his history and writings. We are the only Museum to celebrate Gordon as far as we know. The exhibit contains his duck boat, decoys, typewriter, writings, pictures, medals and awards, and many other items of interest. We continue to seek and add items to our collection. Also, we host an annual gathering in the fall to present informational material in the form of a program to expand on the life and times of Gordon and the Old Duck Hunters Association. We also hold periodical presentations of related subjects of interest. As an adjunct to our BAHA membership, we are offering memberships in the ODHA Circle. If you choose to join this select group, you will receive benefits as well as help to support the continuing expansion and maintenance of the Gordon MacQuarrie Exhibit. Some of the benefits you will enjoy are; an ODHA membership card, your name and town posted on the ODHA Circle membership chart, free access to the Museum and all its exhibits, notices of upcoming events and activities of the Museum and the MacQuarrie events, being a member of an exclusive and unique Circle, invitations to and minutes of the Board meetings, the ability to arrange special visits to the Museum outside normal operating hours, and much more. The Museum will benefit from your support to its ongoing efforts. Since this is new in 2017, initial membership will expire December 31, 2018. Renewals will expire on December 31st of each subsequent year. If you would like to join this prestigious group, an application is provided below. 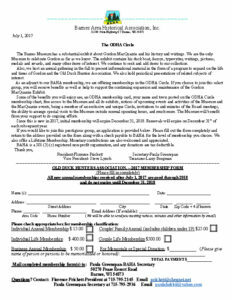 Please fill out the form completely and return to the address provided on the form along with a check payable to BAHA for the level of membership you choose. We also offer a Lifetime Membership. Monetary contributions are also welcomed and appreciated. BAHA is a 501 (3) (c) registered non-profit organization, and any donations are tax deductible.